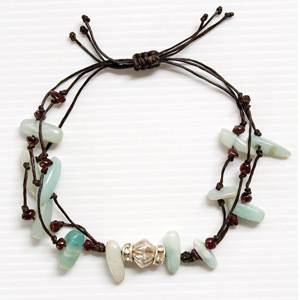 Caught in waxed nylon threads, agate and garnet form a feminine design for the young lady. Artisan Ying centers the piece with a silver charm framed by facetted glass set in metallic cylinders. The necklace length can be adjusted by sliding the strings. Materials: Agate, garnet, glass, waxed nylon and silver (.950). This gemstone jewelry is handcrafted by Ying. She works from home in Chiang Mai.